The batshit-crazy closing ceremonies of the 30th Summer Olympiad barfed all over our TV screens last night. I say that in the best possible way, of course. 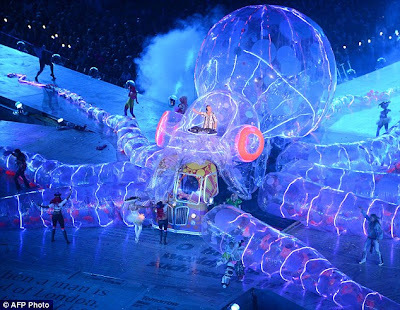 If you didn't catch it, you can Google all kinds of images and video clips from the show, which included a flying saxophone player, a veritable army of of people wearing bowler hats topped with light bulbs, a giant foam jigsaw puzzle of John Lennon's face, and Russell Brand singing "I Am the Walrus" through a megaphone. I am not making any of this up. I am not that creative. Let's see, there was also Eric Idle leading a crowd sing-along of "Always Look on the Bright Side of Life" backed by rollerblading nuns and a kickline of Roman centurions. Some dude in an orange hoodie named Ed Sheeran - who looked like a cross between Prince Harry and Seth Rogen in Knocked Up - sang the world's most pointless version of "Wish You Were Here." The Spice Girls performed by popular demand of nobody I know. George Michael appeared dressed as at least two members of the Village People. The Pet Shop Boys performed in very large and pointy hats. Annie Lennox looked outrageously beautiful atop a Goth pirate ship. Seriously, this all happened. Ladies and gentleman, allow me to present Fatboy Slim smiling and waving from a giant, translucent, neon-lit octopus balloon. Because when the organizers of the London Games saw the magnificent Olympic pageant in Beijing in 2008 and thought "That's the mark, that's what we have to top in 2012," this is what they spawned. Sorry, Rio de Janeiro. I don't know if there are enough magic mushrooms in all of Brazil to inspire you to surpass what London hath wrought.